← How Are You Going To Light It Up Blue? I wrote an op-ed piece for the Erie News Times and I wanted to share it with you. As communities around the globe prepare to celebrate World Autism Day, we look back on a year that has been unprecedented in advancing the diagnosis and treatment of Autism Spectrum Disorders (ASD). More and more studies continue to make headlines as we build upon a foundation of knowledge established over the last twenty years. As the Autism Speaks chief science officer states, “When it comes to scientific discovery in autism research it just keeps getting better and better.” I would like to share a few ground breaking developments in the areas of eye gaze, folic acid and technology. Ansley Brane, a typically-developing 5-month-old participating in eye-tracking research at Marcus Autism Center. my child have autism?” Fortunately, we no longer have to wait until a child turns preschool age to answer that question. Reliable screening tools can be used with children as young as 12 months of age. In a new study, researchers used high tech eye tracking to discover a subtle but consistent decline in eye contact that begins around two months of age in babies who go on to develop autism. If the initial results are confirmed, this finding would provide the earliest biomarker of ASD. Intervention could begin earlier than ever before possible, leading to real improvements in brain development, learning and social engagement. For years, we’ve known that taking folic acid during pregnancy played an important role in producing red blood cells and helping the fetal neural tube develop into the brain and spinal cord. However, in 2013 we learned that maternal use of folic acid supplements around the time of conception was associated with a lower risk of autistic disorder. The findings support previous research that shows children of mothers who take folic acid in the four weeks before and eight weeks after conception had a lower risk of developing autism. Closer to home, the Barber National Institute began collaborating with the University of Notre Dame to ensure that advances in the research lab translate to the real world of school and home. We are examining whether including an interactive robot in therapy sessions improves the development of social skills over traditional methods. 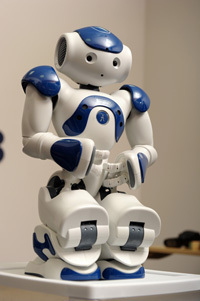 We know that many children with ASD have a natural interest in technology and are very motivated by the robot. Preliminary results compiled in Erie and at Notre Dame indicate that a majority of children with autism are more successful learning new skills when working with the robot as compared to just a therapist. More importantly, the children are able to generalize the skills they are learning with the robot to communicate better with their parents and other children in their lives. We began diagnosing increasing numbers of children with autism in the early 1990s. These children are now in their early 20s and may be in college or post-secondary training programs and / or in the workforce. Unfortunately, we also know that young adults with ASD are less likely to continue their education or get a job after high school when compared to young adults with other disabilities. Only about 35% of young adults with autism attend college and only 55% have a job during the first six years after high school. Overall, they face a greater than 50% chance of being unemployed or not attending college when compared to those with other disabilities. For many families of children with autism, leaving high school is compared to falling off a cliff because of the lack of services and jobs for adults with ASD. Ryan working at BNI through the TWS program. better?” If you are a business owner, hire a person with autism. Contact our Supportive Employment office, tell us about your job and we will find the right candidate for you. There is no expense to you and we provide a job coach to train the candidate on the job. If you are an employee, welcome and encourage diversity in your workforce. If you are a citizen, support an inclusive Erie community by welcoming people with ASD to your events, health clubs, churches and schools. This can only be a win / win opportunity for the person with autism and for all of us. This entry was posted in Uncategorized and tagged 1 in 68, advocacy, asd, aspergers, autism, autism awareness, autism issues, autism research, barber institute, barber national institute, bni, ELBS, eye contact, folic acid, infants, light it up blue, research, robots, special needs. Bookmark the permalink.